Whew! I've just about recovered from watching the beast that is Altior get up for another victory to match Big Buck's record of 18 straight wins over the jumps. What a horse. Tomorrow sees the third installment of the Defi Du Seuil and Lostintranslation rivalry in the JLT at 13:30. The Ryanair Chase (14:50) throws up the likes of Monalee, Footpad, Balko Des Flos and Un De Sceux. What a battle that will be. The headline race of the day is the Stayers' Hurdle (15:30) where Paisley Park aims to beat the much-loved Faugheen. You can see the full racecard for tomorrow here. City Island bolted up in the Ballymore for trainer Martin Brassil's first Cheltenham winner. Strong market leader Topofthegame just pipped Nicky Henderson's Santini to the winning post in the RSA. Altior made it 18 consecutive victories but was given a run for his money by Sceau Royal and Politologue. 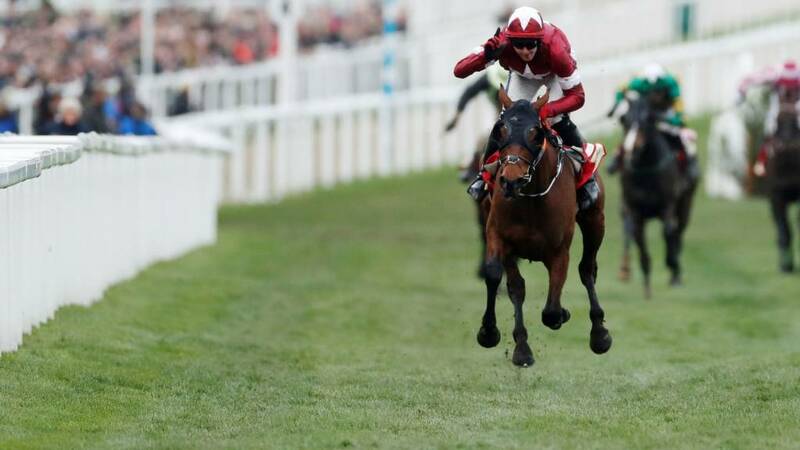 Grand National champion Tiger Roll won his fourth Cheltenham title to give trainer Gordon Elliott his first win of the Festival. That was the name of my local chippy. "Ahhh it's not the race of the week," he modestly tells Thommo. "This horse deserves a lot of credit. Last year he was sold here at the February sale and to land back a year later with victory is incredible." From the punters' point of view, you saw papers going in the air: they're happy. Blue Sari was very gallant in defeat but it was a very game performance from the winner. Winning trainer Gordon Elliot after Envoi Allen backed up Tiger Roll's performance for his second victory at the Festival: "What a difference an hour makes. An hour ago I was on the ground. "We're under pressure coming here, winners expected a rough week but this is a good horse. Jamie Codd is a good man! "Another winner makes the difference. I'll have a few to celebrate tonight - you have to enjoy the good days." That 10th Champion Bumper winner for Willie Mullins just eludes him as Gordon Elliott gets his second winner of the day, and the Festival, after Tiger Roll's earlier demolition in the Cross Country Chase. Envoi Allen just about fends off the late charge from Blue Sari. A second winner this year from Jamie Codd who also won the final race yesterday. The two markets leaders go head-to-head in the back straight! Quite a few travelling well here. The aptly-named Abacadabras going very well. We've passed the halfway stage with only 10 lengths between Some Detail up front and Thor de Cerisy at the back. They're all pretty stretched out in the first half-mile with Some Detail and Master Debonair take us on. Two miles to race, Some Detail takes an early lead. It's getting darker at Cheltenham, although not quite twilight time yet. Looking across to the middle of the course I can see one of my favourite images at Cheltenham: those bookmakers' boards illuminated with the prices in red and horses' names in yellow. They are almost like Chinese lanterns in the distance. I think it will be a big loss when on-course bookmakers are no longer here. Envoi Allen and Blue Sari lead the betting for this one but I'm on Ask for Glory. Let's see how the Paul Nicholls horse gets on... here we go. Finally for day two, the Champion Bumper - a National Hunt race run on the Flat. This race has been the domain of Willie Mullins for many years but this year he only has one runner and will be hoping Blue Sari can give him a 10th win in the race. Envoi Allen, who is unbeaten in his three runs so far, leads the Gordon Elliott charge while Master Debonair won at Prestbury Park in November and is definitely one to watch. Just the one race left today then and it's the Champion Bumper. Willie Mullins has won this race nine times so keep an eye out for Blue Sari. Jockey Callum Rodriguez is facing a lengthy ban from racing following a failed a drugs test. The 21-year-old, based with County Durham trainer Michael Dods, rode 68 winners in 2018. It is understood cocaine was found in Rodriguez's sample. He is suspended pending an investigation by the British Horseracing Authority. "My one-off action was completely out of character and one that I deeply regret," said Rodriguez in a statement.